Beat the yolks in a mixing bowl until thick and pale. Gradually add one cup of the sugar and continue beating until the sugar is dissolved and the volume has tripled. Slowly add the champagne. Place the bowl over a large saucepan of hot water set over low heat. Continue whisking until the mixture is very hot to the touch and thickened, about 10 minutes. Transfer to another bowl and cool to room temperature, whisking occasionally. Melt the chocolate in a bowl over hot – not simmering – water and add about one fourth of the yolk-sugar-champagne sauce, or zabaglione, to the chocolate and whisk vigorously to combine. Then add the chocolate-zabaglione mixture back into the main body of the zabaglione sauce and fold, using a large whisk or rubber spatula to combine thoroughly. Cover and refrigerate at least 2 hours or overnight. Toss the raspberries gently with 2 tablespoons sugar and the Chambord. Set aside. Trim the crusts from the cake and cut it into ½ inch slices. Fit the slices into the bottom of a 9-inch springform pan, trimming the pieces and filling in any gaps. Strain the raspberries, pouring the juice over the cake slices. Reserve the raspberries. In a mixer, beat the cream cheese, the remaining 3 tablespoons sugar, and the vanilla until light and fluffy, about 3-4 minutes. Fold in the sour cream and two thirds of the chilled zabaglione mixture. Spread this mixture evenly over the cake. Sprinkle the reserved raspberries over the top. Beat half a cup of the heavy cream to soft peaks and add it to the remaining zabaglione, folding carefully. Spread this mixture over the raspberries. Cover and place the dessert in the freezer for at least 4 hours. 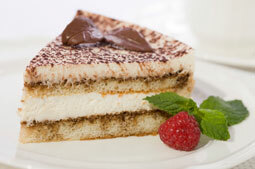 Soften the tiramisu slightly in the refrigerator before serving. If desired, beat the remaining heavy cream to stiff peaks and, using a pastry bag fitted with a star tip, garnish the tiramisu. Marcy Marceau is a partner in The Roupinian Group, which manages The Lyme Inn, and former Pastry Chef. She still enjoys creating tasty desserts like this one in her spare time.